For the weekend that’s in it, we’ve gone pumpkin mad. It’s a beautiful vegetable that usually gets carved rather than cooked at this time of year. I picked up the Kuri squash variety from Fallon & Byrne in Dublin. This is a smaller, more manageable pumpkin, ideal for roasting. I put it to work in both the pumpkin pasta and pumpkin salad this week. Peel the pumpkin and slice it in half. Remove the seeds. Set aside one half of the pumpkin to use in another recipe, such as our pumpkin salad. Dice the pumpkin into small bite-size pieces. Heat the olive oil in a large frying pan over a medium to high heat and fry the pumpkin with the bacon lardons for 15 minutes, until softened and charred. For the last 5 minutes of cooking, add garlic to the pumpkin and bacon, frying until cooked through. Add the sage leaves to the pan and cook for a further minute. Meanwhile, cook the spaghetti according to its packet’s instructions .When it’s ready, drain the spaghetti and return it to the saucepan. Add the butter and mix through until the butter has melted and coated the spaghetti. Divide the spaghetti between two bowls. Top with a few spoonfuls of pumpkin and bacon. Sprinkle with Parmesan cheese, and a generous pinch of salt and pepper. Peel the pumpkin and slice it in half. Remove the seeds. 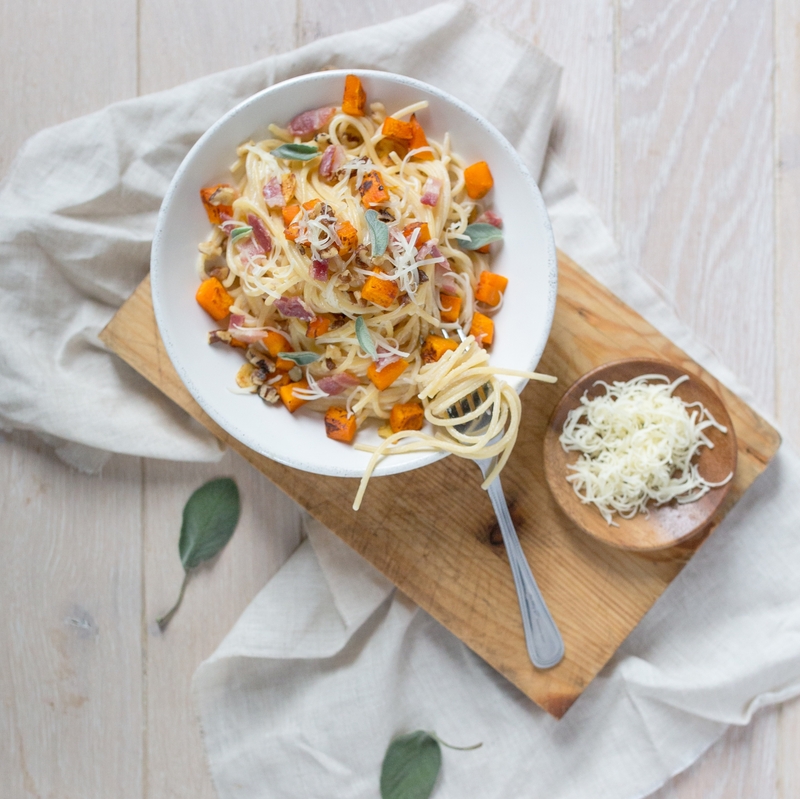 Set aside one half of the pumpkin to use in another recipe, such as our pumpkin pasta. Chop the pumpkin into bite-sized chunks and place in a roasting dish. Slice the garlic bulb in half and place it around the pumpkin in the roasting dish. Pick the leaves from the rosemary sprig and scatter around the pumpkin. Drizzle with two tablespoons of rapeseed or olive oil. Add a pinch of salt and pepper. Roast in the oven for 30 minutes at 200c/180c fan/gas mark 6. Once cooked, remove from the oven and allow to cool. Divide your salad greens between two plates. Top with the roasted pumpkin. Dollop the soft goat cheese around the salad. Scatter the pumpkin seeds over the salad. Drizzle with the rapeseed or olive oil, and finish with a sprinkling of salt and pepper. Having a little bag of pumpkin seeds in your pantry means you can add them to salads or baked breads, or to your early morning porridge.